Another week, another weekly roundup... Clocking in at only two films watched this week, this may be the shortest entry to date. I shall have to do better next week. A good old fashioned splatterfest, Re-Animator has to be the goriest film I've seen since Braindead. The plot sees a doctor who has devleloped a 'reagent', capable of bringing the dead back to life, take up residence in a small medical school in Massachusetts. Unfortunately, those brought back from the other side tend to be a tad disgruntled, and want to wreak some vengeance on the living. Although it's enjoyably deranged, the film isn't without it's flaws; it's a low budget production, and most of the budget has gone on the special effects. Therefore, some of the acting is a little off - it ranges from the sublimely hammy (David Gale as Dr Carl Hill) to the ridiculously wooden (Bruce Abbott as leading man Dan Cain). 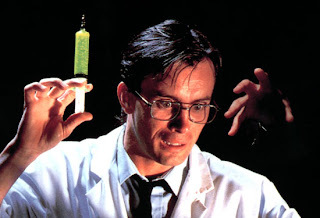 On the other hand, Jeffrey Combs puts in a fine performance as the implacable mad scientist Herbert West. If the good people at Re-Animator Productions wanted me to provide them with an inappropriate, partly plagiarised quote for their poster (and they have only to ask), it would be as follows: "It's good clean fun for all the family (no old people though, they're not covered by our insurance)." This film, a colloboration between J.J. Abrams (director) and Steven Spielberg (producer), was made with the intention of evoking memories of some of Spielberg's early movies - classics like Close Encounters of the Third Kind and E.T. Set in the late '70s, the film tells the tale of a gang of teenaged friends from a small town in Ohio who are spending their summer holidays making their own low budget zombie movie. The group includes budding director Charles, his best friend and make up expert Joe, special effects guru/ pyromaniac Cary and lead actress Alice. After sneaking off late at night to shoot a scene at an abandoned railway station, they witness a horrifying train crash. From the wreckage of the train cars emerges a creature from outer space... This was the blockbuster movie I was most looking forward to this summer, and it didn't disappoint. Watching child actors can sometimes be rather cringeworthy, but the kids in this film all put in terrific performances, particularly Elle Fanning as Alice and Joel Courtney (in his first big screen role) as Joe. The scenes in which the gang are directing their zombie movie are touching and funny; to be honest, I could have watched an entire film just focussed on the kids' attempts to win the local film festival. If the film does have any weak elements, they crop up in its second half, where the alien storyline is more prominent. I enjoyed the fast paced action scenes of the conclusion to the film just fine, but wasn't quite as captivated as I had been at the beginning. Nevertheless, after quite a few underwhelming popcorn movies this summer, Super 8 is a breath of fresh air.